The holidays can be overwhelming for anyone, but Zoey is ready to explode when Maurice, her closet-monster roommate, takes celebrations to the extreme. When Zoey ducks out for a little fresh air, she finds a boy with a big problem -- a problem only a mythical creature can have and only Zoey can solve. 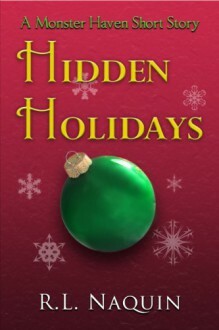 Hidden Holidays is a short story in the same world as the Monster Haven novels from Carina Press. This story can be enjoyed without having read the novels, but it takes place between book two, Pooka in My Pantry, and book three, Fairies in My Fireplace. The idea is great. The story itself is okay. I have feeling, however, if that I read a whole book with the main character I would want her to get killed - she is a one hell of a princess perfect. Still, not bad.